Sophomore Owen Elliott, pictured here, had a great performance at the MEC Tournament, but came up just a little short in the end. (Photo courtesy of Shepherd University's Athletics Department). 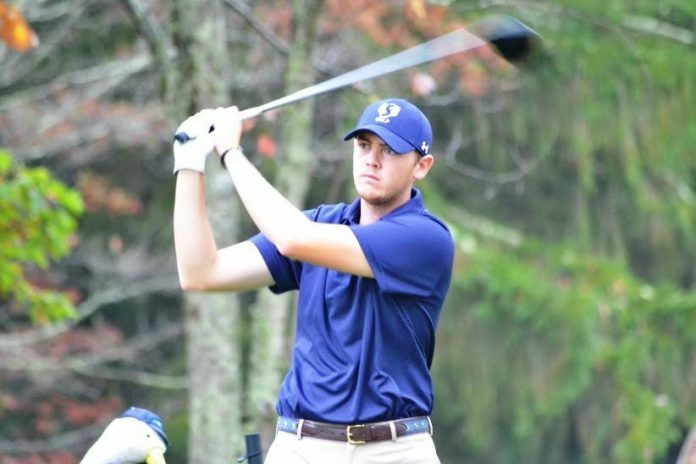 Over the course of a three-day tournament that lasted from Monday until Wednesday afternoon, the Rams came in a tie for fourth place out of 11 teams participating in the MEC Tournament at The Resort at Glade Springs, W.Va. The Rams shot 928 over three rounds, which was not quite good enough to knock off the Charleston University Golden Eagles, who won the tournament by shooting 887 as a team. Starting off the MEC tournament, the Rams were in second place after Monday’s first round, shooting 303 as a team, which was just six strokes behind first-place Charleston’s 297. Day two did not go as easily for the Rams, as they had trouble finding their groove like they did on Monday. Shooting 314 on the day, this gave the Rams a two-round total of 617. This dragged them back to fifth place in the tournament. As it turned out, Tuesday’s round was a sign of troubling times ahead for the Rams, as they were never able to produce the same type of efficiency they put on display on Monday’s opening round. Wednesday’s third round score of 311 put the Rams at 928 for the tournament. However, the Rams did not really fall apart, the other schools were just a little bit better. The Rams played relatively consistent during the entire duration of the tournament, but had an occasional lapse in shot placement. The individual performances by the Rams more than back this up. Three Rams players finished in the top 17 overall in the MEC Tournament. Sophomore Owen Elliott had a remarkable tournament to remember, as he posted a score of 221 to tie for fifth place. Senior Brandon Dang finished nine strokes behind Elliott, recording a score of 230 to tie for fifteenth overall. Sophomore Trey Euler had a nearly identical tournament score to Dang’s, coming in just one stroke behind with his tournament score of 231, which put him in a tie for 17th place. These three Rams helped carry the team and put the Rams in good position to potentially steal a tournament championship. Sadly for the Rams, it was hard to get everyone playing on the same efficiency level, which would lead to their fourth place finish. Mike Graessle, a sophomore, could not find the same level of consistency that his teammates did, as he shot a score of 246, putting him in 28th place over in the MEC Tournament. Junior Drew Call of the Rams had to withdraw from the tournament. The quality of the competition the Rams faced was undeniable, as many of the schools participating in the MEC Tournament stepped up their game for postseason play. After the tournament, the head coach of the Rams, Edward Dolan, commented about the Rams’ inconsistency in the MEC Tournament. Dolan also was proud of his team’s overall performance during the fall semester. This was the final match of the fall for the Rams. Out of five tournaments, this was the Rams’ second-best display of the fall. Their best finish came in the MEC Fall Classic, where they came in third place out of 12 teams. Based on how the fall campaign started with three disappointing tournament finishes, the Rams showed a lot of resiliency, as they were able to bounce back and close out the fall campaign with two stellar performances at last week’s MEC Fall Classic and here at the MEC Tournament in Glade Springs, W.Va.
Next articleAs there is rain in the forecast, make sure to stay dry today on campus.